Happy New Year to my Bermuda family! As 2017 gets underway, we Bermudians have much to look forward to. The OBA Government is moving Bermuda and all her people in the right direction. We are getting the island back on track. I truly believe the majority of Bermudians have no doubt about the need to replace our crumbling, decades-old Airport terminal. The airport has not only become an embarrassment and inconvenience for travellers but also a safety issue for staff. The former administration knew we needed a new terminal and spent more than $3 million developing plans that would have cost more than $500 million to build, but they couldn’t figure out how to get the financing. Now we, the democratically elected Government, who were given a mandate to turn Bermuda around and get our people back to work, have come up with a creative way to build a new airport that will not burden the tax payers with more borrowing. The history of capital projects in Bermuda is a sad story. It is clear these past projects were, in the words of the former Opposition Leader, avenues for the ‘politics of plunder’ and I understand how people would feel this way. However, as a member of the Public Accounts Committee, I have been fortunate to attend workshops in Jamaica and Trinidad where we discussed issues with capital projects – the world-wide problem of how politicians get their fingers in the pie. We need look no further than examples such as the “Big Dig’ in Boston, the Russian Olympics, and of course examples closer to home such as the projects under investigation by the Commission of Inquiry. This provides more reason to do this airport project in the manner we are doing. This new project will create hundreds of new jobs for Bermudians and will greatly enhance our new found reputation as the hot new destination to visit. First class, first tier, first world. That’s what we need for Bermuda. Look at the press we are getting around the world, my brothers and sisters – TV shows, newspaper and magazine articles, online travel sites and blogs – publications that attract a world-wide audience such as Conde Nast, Ebony, Lonely Planet and many others. Bermuda has been billed as the place to be in 2017 and beyond, thanks to our investment in the America’s Cup and other sporting events, new hotels and more. We are back on the tourism map. Opposition to this progress is crazy. Bottom line is that the Combined Opposition of the PLP, People’s Campaign and Union leaders are looking to derail these awesome projects because they want to win the next election. They are putting their love of party ahead of our island home. I was there sitting in the audience at the head table and had to restrain myself from standing to my feet and challenging his self-serving speech. Less than a year later the former Premier outlined the tactics of a “sustained programme of … disinformation and criticism …” to remove the One Bermuda Alliance from government. MP Lawrence Scott echoed these sentiments at the Pathways to Status protest in March last year. MP Scott was filmed talking to protestors. He explained that if they could continue to block Parliament for long enough to prevent the Budget debate going ahead, then the Governor would be forced to dissolve Parliament and call a new election. Family, the combined opposition is playing on deep-rooted fears within the community such as race, inequality and ethnicity to further their political agenda to remove the OBA at any cost, hurting the very Bermudians they claim to represent. 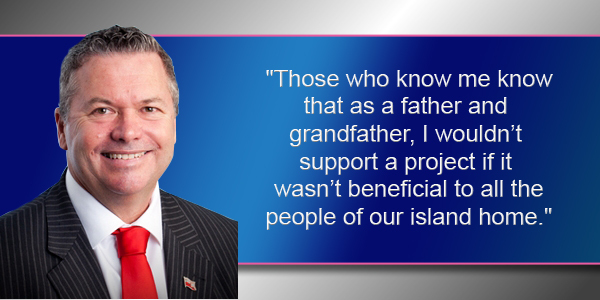 Family, those who know me know that as a father and grandfather, I wouldn’t support a project if it wasn’t beneficial to all the people of our island home. The airport redevelopment has been the most transparent project in Bermuda’s history and will be of huge benefit to us all – without increasing our already huge debt that is the responsibility of every Bermudian, and will be taken on by those not yet born. More than a dozen public and private town halls and meetings have been held. There have been countless videos, press conferences, articles, social media posts and hundreds of pages of documents released to the public on this project. Finance Minister Richards has gone to great lengths to explain every possible aspect of this deal. I, and many in our community, are convinced it’s good for Bermuda and Bermudians. My fellow Bermudians we need to take a good hard look at what is going on around us and ask do we want to keep moving forward for the benefit of our children or do we want to go backwards? The OBA set out to create jobs and opportunities – a better Bermuda for all Bermudians – and that is what we are doing. I believe with all my heart that in 2017 and the next few years there will be countless opportunities that will benefit us all. One love, one Bermuda – we rise together.